The Ts: Metz Cathedral and the Birth of "Simplicity Sightseeing"
Metz Cathedral and the Birth of "Simplicity Sightseeing"
Saint Stephen's Cathedral - Metz, France. 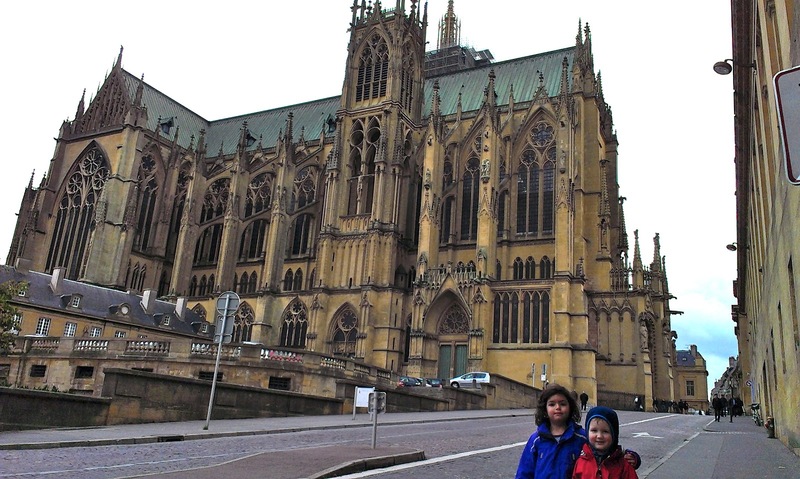 The kids had this past week off school, and Pete took the week off from work (Europe = more vacation time!). We spent the first part of the week just hanging out as we typically do - lots of pajamas, music, walks, playgrounds, leisurely meals, and unstructured play for the kids. Thursday was a national holiday, and Friday we had a borrowed car from a church friend on vacation. Although we really are quite content generally lazing about, we decided we MUST get out and do SOMETHING. 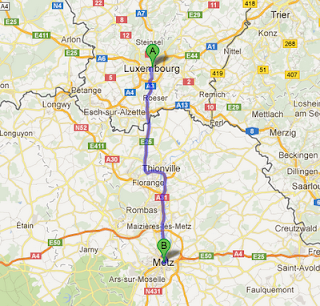 We chose to visit France for the first time since arriving in Luxembourg. The closest town of note is Metz, 45 minutes directly south. We woke up on Friday to cold, gray, wind, and diagonal rain, but we weren't going to let that deter us. 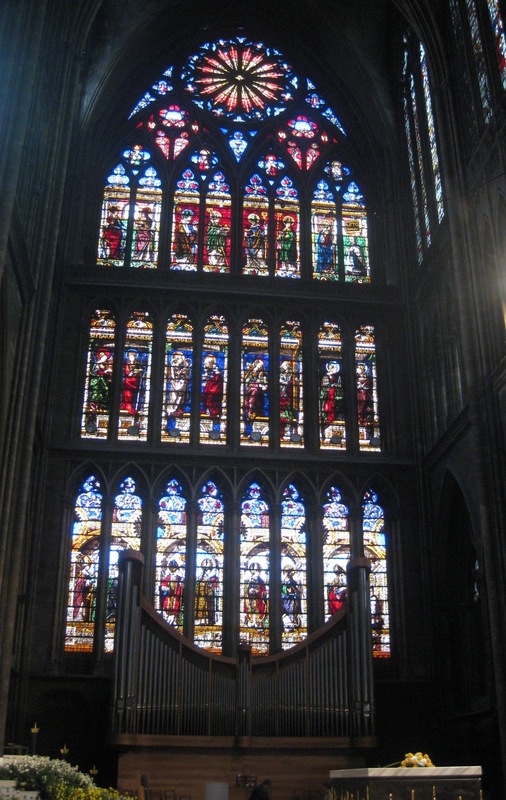 After some Google searching I identified a half-a-dozen "sights" we could visit in Metz. I should re-emphasize here that carefully plotted sight-seeing isn't really our thing, so we planned on mostly winging it anyway. We packed a lunch since we'd planned to eat out for dinner later. We found an awning and feasted like...hobos. amazingly, the restaurant staff didn't make us leave. Then we quickly headed for the shelter of the cathedral. 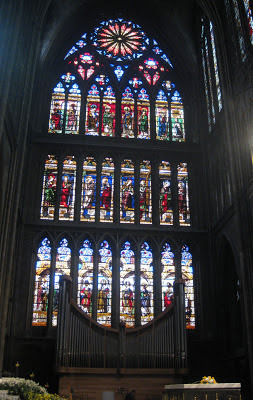 We spent quite a while perusing the particuarly large expanses of stained glass windows (Wikipedia now tells me they're the largest in the world?? ), installed gradually over the span of several centuries. Pete and I had a fun moment when we both recognized the unmistakable work of Marc Chagall on several of the panels. We had visited the Marc Chagall museum in Nice, France on our trip with our church choir in 2005. Even though Daphne had been keen to explore a bit more (hence the split from James and Pete), after grabbing our pastry snack she was satisfied and ready to go home. So that's what we did. 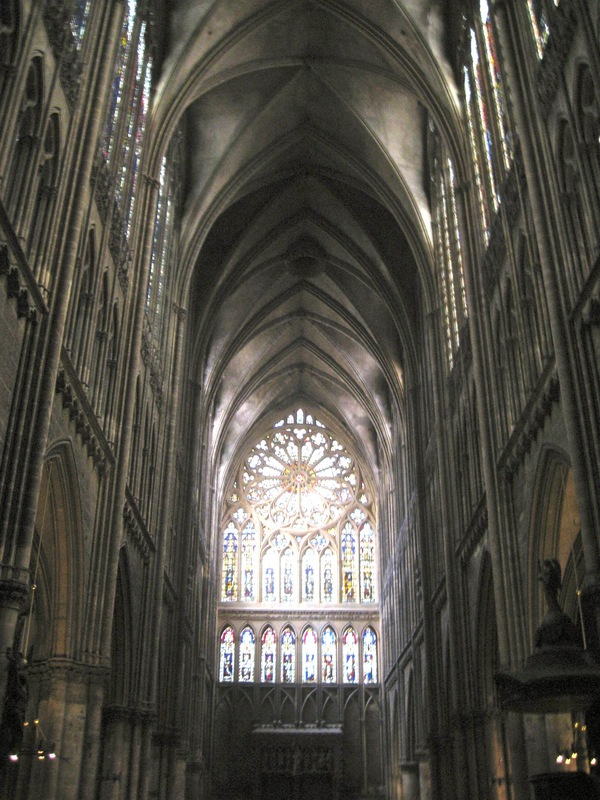 We went to France, saw a cathedral, got a pastry, and went home. But why did we feel sort of weird and "lame" about it? We drove to France for the first time and that's all we did? I pondered these feelings for a bit. Then I had an epiphany. One of my favorite books is called Simplicity Parenting. As the title would suggest, the author is an advocate of a "less is more" parenting style. By limiting their toys and activities to a select few, children are able to more deeply and thoroughly enjoy and appreciate what they have/do. For us, this philosophy spills beyond our parenting into how we generally try to live our lives. 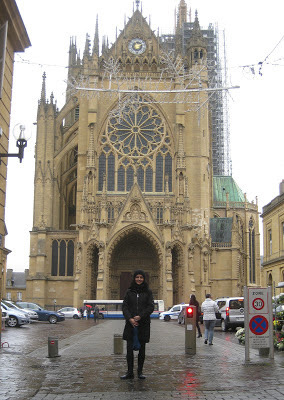 And thus, my French epiphany: "Simplicity Sightseeing." Why should our approach to sightseeing be any different then the way we do everything else? Why should we feel pressure to "see everything" a place has to offer in order to make the trip worth while? Why can't we intentionally pick and choose, slowly savor? Might this approach be more meaningful and memorable for the kids as well? By avoiding overstimulation and rushing from place to place, they can more thoroughly enjoy the simple pleasure of a simple experience, with the resulting memories more deeply ingrained. It was so pleasant to just be sheltered from the elements and slowly soak in the beauty of the cathedral as a family, taking the time to notice and discuss the details. So! Henceforth, we are officially done feeling strange or guilty or "lame" for not doing more when it comes to sightseeing. The key from now on will be to make this an intentional approach. 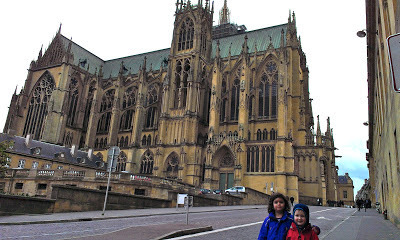 Imagine we'd set out on Friday with the clear intention: "Let's go see the cathedral in Metz, grab a nice French pasty, and then head home" instead of: "Let's go explore the top 5 things Tripadvisor told me to do in Metz because we only have a car for a limited time so we need to make the most of it." It would have been true to our family's approach to life and thus completely satisfying. No lingering feelings of loser-sightseeing or not seizing the appropriate opportunities. The next time we go to Metz I think we will go with the express purpose of visiting the Pompidou Center (annex to the famous Pompidou modern art museum in Paris). It's right next to the train station so we don't even need to borrow a car. 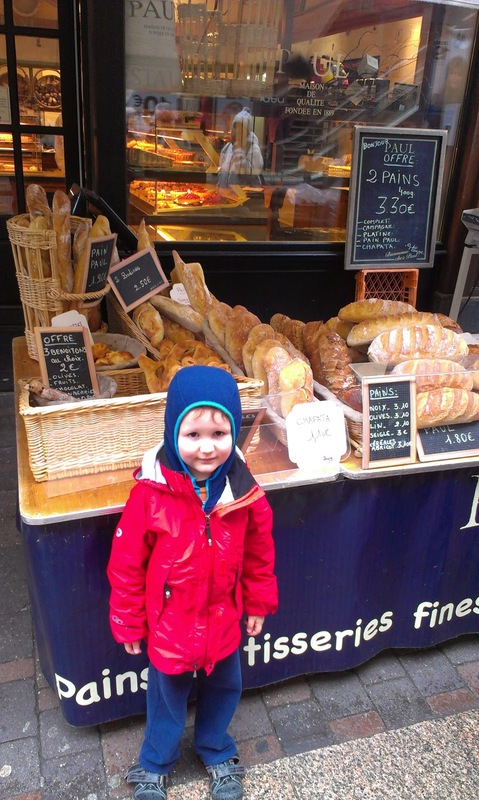 Then we'll grab a pastry and go home. Grabbing a pastry is an essential tenant of Simplicity Sightseeing, just so you know. Are there any other Simplicity Sightseers out there? Does this approach appeal to anyone else? Let me know! Loved your post Ts. I know the feeling about thinking "I hadn't seen it all or anything for that reason." Either on my own or with the kids or with the family, I like to ease into my day and get out to do one thing and I am okay with that. I feel peaceful and calm and not rushed and crazed. 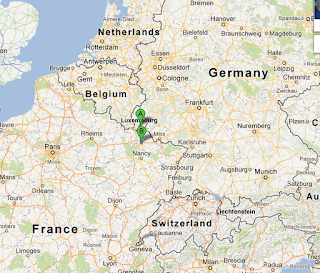 I went to Belgium for five days and saw the the Chocolate factory-how is that for not seeing it all. I get out to some places and just do one thing or none, but food is always a part of it. As long as there is a moment to sit and enjoy the view, I feel pretty good about my day. Yes, and since France is just down the road a bit, and Germany just up the road a bit, no need to fit everything in at once! And you get to do things like "stumble upon" some Marc Chagalls....Looks like a wonderful tour to me. I have discover your blog through Fionna's one. 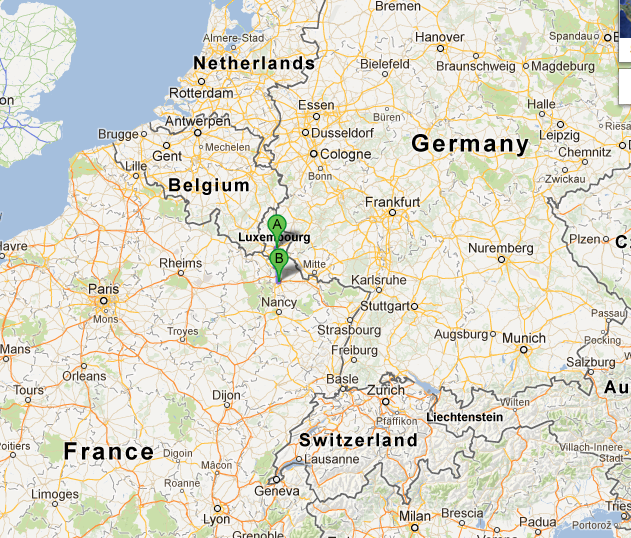 I am not an expat but I am living in Luxembourg. Yes, when we travel, I tend to pack our trip, really really full. So full that at the end we can't follow the planning. So I do love your approach and think it is a very good one. It is the one we had during our last trip not by choice, but because of circumstances and it felt good! Daphne, you're a good photographer! You take after your Mom and Granddad. 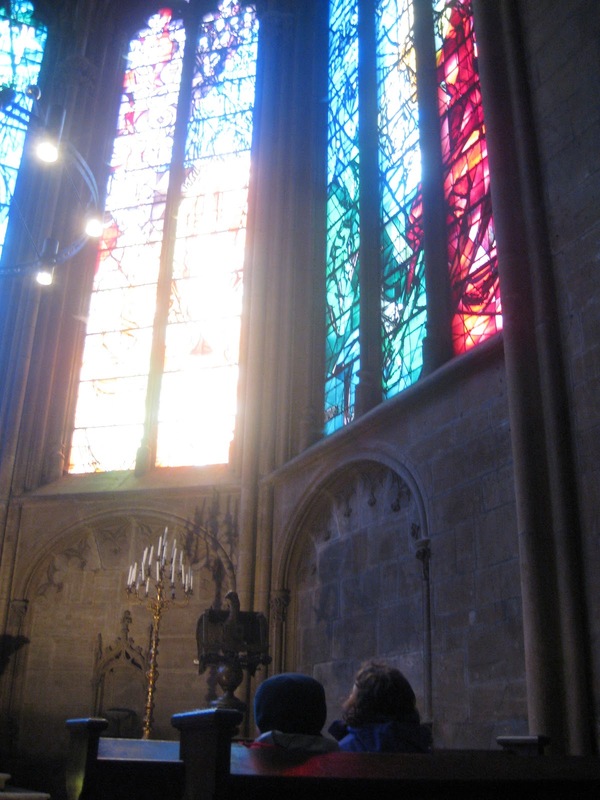 I think a pastry treat goes perfectly with visiting cathedrals, churches, castles and museums.